Seeds in Salads, Sauces etc. I keep raw and toasted nuts and seeds on hand, for snacking, adding to salads, etc. I use lots of sunflower and pumpkin seeds which I buy in quantity raw and then toast in smaller amounts. 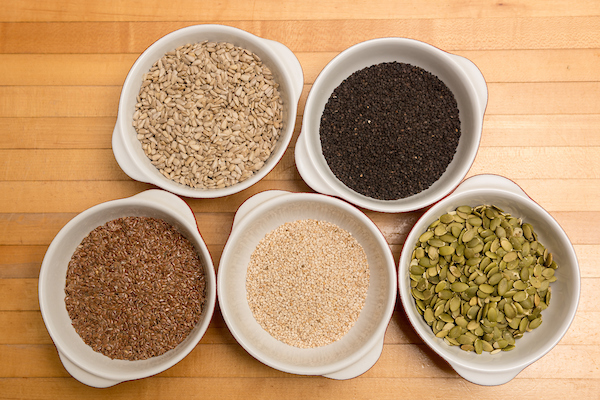 I also use sesame seeds (white and black) as well as flax and chia seeds, occasionally. Toasted they lose their crunch after about a week in a tightly sealed jar in the cupboard. I keep both raw and toasted seeds in airtight containers in a cupboard, not the fridge. 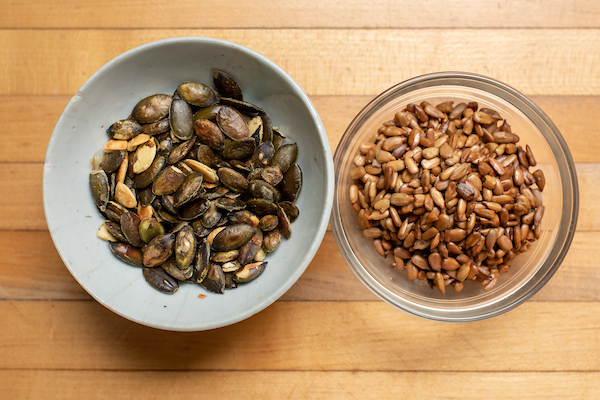 To toast sunflower seeds preheat oven to 350 degrees. Toss seeds with a little olive oil and salt, if you’d like, and spread on a sheet pan and toast until golden and toasty smelling, about 10 to 12 minutes. Toast pumpkin seeds in a dry skillet on the stove top for a few minutes, until puffed and golden, taking care not to burn them. Sesame seeds are quickly toasted on the stove top in a dry skillet in a just a few minutes. Watch them carefully and move them around the pan as they quickly burn. Having a jar of toasted sunflower or pumpkin seeds on hand enables you to quickly enhance a salad with taste, texture and heft and make it more of a meal. I often employ this strategy for lunch-time salads or add them at dinner when a salad might be a key part of the meal, like in this salad which includes beans and seeds. They can also take the place of croutons in salads. Toasted sesame seeds can be added to soba or egg or rice noodle salads or green salads. This arugula and walnut pesto is delicious as a spread, with roasted vegetables or with beans or pasta. This toasted pumpkin seed and parsley pesto is good on toast, with eggs, or thinned to use as a salad dressing for grain and roasted vegetable salads. Toasted seeds make a wonderful garnish for soups such as this cauliflower soup and stews or other dishes, sometimes taking the place of croutons. Toasted sesame seeds are delicious on Japanese cabbage pancakes (Okonomiyaki).